Nevner flere måter som CO2 virker som en antioksidant, i tillegg som en beskytter av andre antioksidanter. Dette er en teorietisk gjennomgang. Carbon dioxide interacts both with reactive nitrogen species and reactive oxygen species. In the presence of superoxide, NO reacts to form peroxynitrite that reacts with CO2 to give nitrosoperoxycarbonate. This compound rearranges to nitrocarbonate which is prone to further reactions. In an aqueous environment, the most probable reaction is hydrolysis producing carbonate and nitrate. Thus the net effect of CO2 is scavenging of peroxynitrite and prevention of nitration and oxidative damage. However, in a nonpolar environment of membranes, nitrocarbonate undergoes other reactions leading to nitration of proteins and oxidative damage. 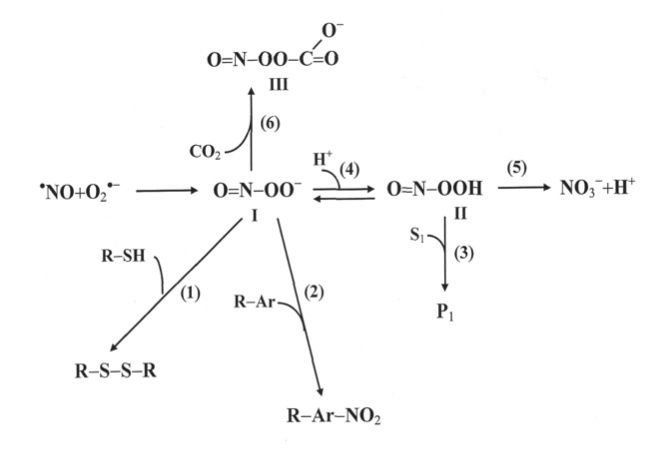 When NO reacts with oxygen in the absence of superoxide, a nitrating species N2O3 is formed. CO2 interacts with N2O3 to produce a nitrosyl compound that, under physiological pH, is hydrolyzed to nitrous and carbonic acid. In this way, CO2 also prevents nitration reactions. CO2 protects superoxide dismutase against oxidative damage induced by hydrogen peroxide. However, in this reaction carbonate radicals are formed which can propagate the oxidative damage. It was found that hypercapnia in vivo protects against the damaging effects of ischemia or hypoxia. Several mechanisms have been suggested to explain the protective role of CO2 in vivo. The most significant appears to be stabilization of the iron-transferrin complex which prevents the involvement of iron ions in the initiation of free radical reactions. Dette innlegget ble publisert i Forskning og artikler og merket med CO2, nitrogenmonoksid, oksidativt stress, pH. Bokmerk permalenken.